Purpose: Use this document as a reference for how to add or update speed keys in ctcLink. Select the Add a New Value tab. Enter the SetID and SpeedType Key. User ID and Primary Permission List are optional. Enter the Description of the speed type. Select the Type of SpeedType from the dropdown list. One Operator: Only the operator specified in the User ID box can use this key combination. One Operator Class: Only the operator class specified in the Primary Permission List can use this key combination. Universal (All Operators): All operators are authorized to use this combination. 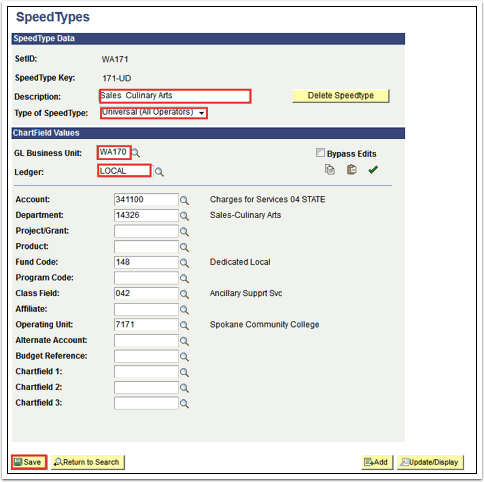 Select the GL Business Unit and Ledger associated with the speed type. Enter the appropriate chartfield information. Enter the SetID and SpeedType Key, if known. 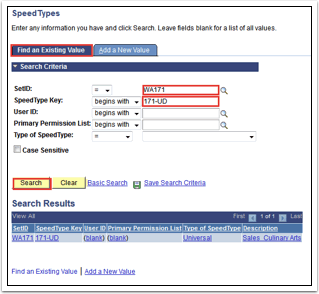 You can search all speed types by leaving the SpeedType Key field blank. 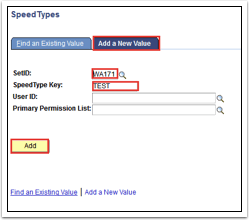 Update the appropriate fields for the speed key.